In the world of texting, we all made mistakes like a typo or perhaps you sent a text to the wrong person, or maybe an adult beverage encouraged you to send something you shouldn't have. Whatever you reason will be, there can be so many situation in which a feature like, recalling the message and delete it would save your life. Thankfully, WhatsApp will soon allow you to do just that. 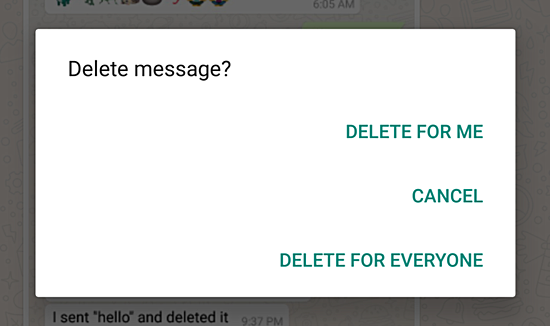 In WhatsApp you can delete the messages but doing that would only delete the message from your end and not from the other persons end.With this latest update, you'll now have the option to delete a message either just for yourself or for you and the person it was sent to. With the update, holding onto the message you'd like to delete and tapping the trash icon near the top of your screen will showcase a few different options – Delete For Me, Delete For Everyone, and Cancel. When choosing to delete a message for everyone, the message on your screen will be replaced with "You deleted this message", whereas your recipient's screen will show the text "This message was deleted." Note :You only have seven minutes to recall a message after you've sent it. This is indeed a very good and useful feature for a lot of users. Keep in mind that WhatsApp only gives you seven minutes to delete a message after you've sent it. Once those seven minutes are up, the person you sent the message to will be able to see it until the end of eternity. Additionally, WhatsApp doesn't give you any sort of notification if you were able to successfully delete a message or not. This feature is rolling is enabled from the WhatsApp Beta v2.17.400, so it appears that the rollout is a server-side thing. The feature should be making its way to more and more devices over the next couple days, however, so keep checking now and then to see when it lands on your phone.